2013 RYLA designees visit the Club. From l. to r. Valerie Nguon, Heather Demers, Alex Rose, Jessica McHugh, Mohamed Hamze, DRC member LouAnn Jendro, Kyle Dumont, Jordan Gauthier, DHS Counselor Geoffrey Kromer, and DRC President Kathy Boyd. 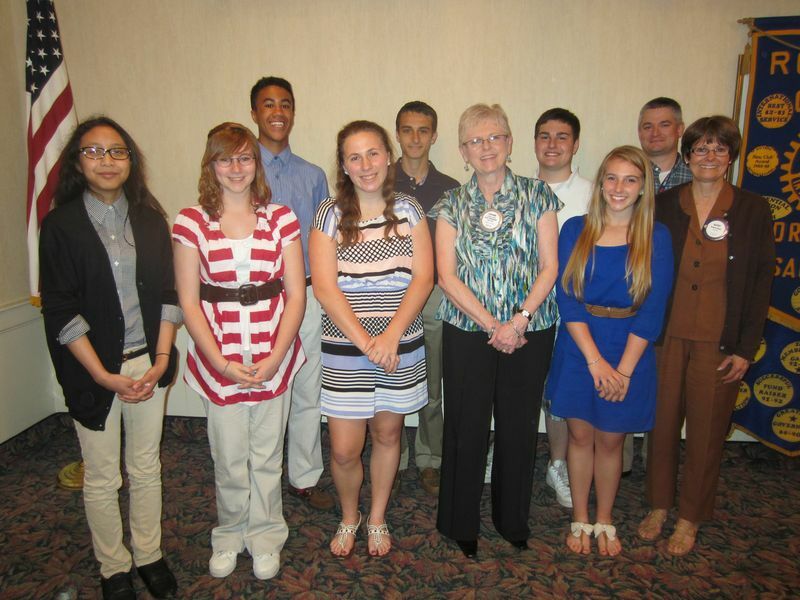 Dracut Rotary Club welcomed seven high school sophomores at this week’s meeting. Six of the students are the 2013 DRC RYLA designees. The seventh is DRC’s alternate selection for the RYLA Conference. RYLA, the Rotary Youth Leadership Awards Conference, is an annual event designed to offer outstanding high school sophomores an opportunity to work and interact together in an atmosphere of friendly competition. The three-day conference provides a program that is intended to challenge the students to utilize and improve their leadership skills. Included in the structured program are interactive Leadership Labs, exciting guest speakers and challenging mental and physical activities that provide them with a chance to excel among and with their peers. They share their experiences with more than 100 other outstanding sophomores from across central Massachusetts. This year’s designees are Heather Demers, Mohamed Hamze, Jessica McHugh and Valerie Ngyon from Dracut High School, Kyle Dumont…a student at Lowell Catholic High School, and Jordan Gauthier…a student at Lowell High School. Selected as this year’s DRC alternate is Alex Rose, a sophomore at Dracut High. As an alternate, Alex may be called on to fill in for any one of the over 100 students who were selected by 54 clubs to attend the 2013 RYLA Conference. The seven Dracut students were selected by the club’s RYLA Committee from a pool of potential candidates who have displayed leadership abilities and who the Club feels will profit most from RYLA. They will be headed to Worcester State University for RYLA at the end of June. The Club wished them well and will host them again in the fall to hear about their RYLA experiences.